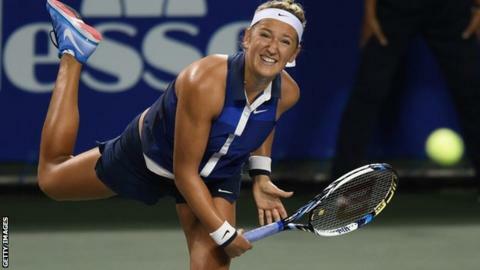 Victoria Azarenka will miss the remainder of the season because of the foot injury that has blighted her year. The two-time Australian Open champion has already missed five months in 2014 and slipped from second to 25th in the world rankings. Azarenka, 25, reached earlier this month and had been scheduled to return to action at the Wuhan Open in China. "It has been a very tough year for me," said the Belarusian. "I have been trying my best to improve day in and day out by pushing and pushing, but that does not appear to be the best approach for me right now. "I will use this time to work on making a full recovery and take care of my body to compete at my best next season. "I always believe that everything happens for a reason, but it is up to you to make the best out of it, and that is exactly what I am going to do." Azarenka and the recently retired Li Na are the only top-20 players absent in Wuhan, where Venus Williams suffered a narrow defeat by France's Caroline Garcia in the first round on Sunday. Williams, 34, led 5-2 in the final set but Garcia responded to come through 6-4 4-6 7-6 (8-6). British number one Heather Watson takes on Italian 11th seed Sara Errani in her opening match on Monday.